The effectiveness of an Ergonomic Chair depends very much on how right it is for the person that is going to use it, and that very much depends on how the user’s requirements were assessed and translated into the specification of the new chair. 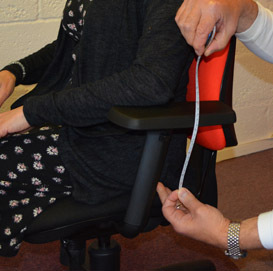 As a company we have established an excellent reputation for our assessment procedure and the detail we put into the chairs we supply to our customers – it’s great when their staff actually go out of their way to tell us how pleased they are and how much more comfortable their working day is because of the chairs that we have to supplied them! Enhancing the effectiveness of our seating assessment service is an enormous portfolio of products that we can select from and find the right product specification for our customers , as well as a the Families of chairs from Ergochair that can be built to a bespoke and individual specification for the user to enhance comfort and performance. Call us now to discuss how we can provide a tailored chair and a tailored approach to suit your company and its employees.